When it comes to acreage, Canada is the world’s second largest country. This limestone formation, known as Rocher Perce (Perce Rock), is off the coast of the Gaspe Peninsula in the Province of Quebec. There once were three arches, but two of them collapsed centuries ago. 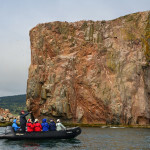 Zodiacs carry passengers from Adventure Canada’s ship Ocean Endeavor to get an up close look at the huge limestone formation that sits off the coast of the Gaspe Peninsula. 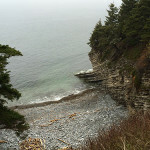 The rock is part of Ile Bonaventure Provincial Park and the nesting area of thousands of northern gannets. Even though our northern neighbors have plenty of open space, they’ve set a goal of eventually protecting about 12 percent of their country’s climate zones and animal habitats. Currently Canada has 42 national parks, as well as additional provincial parks and other protected areas. On a recent 11-day cruise down the St. Lawrence River with Adventure Canada, we were lucky enough to see some of this spectacular real estate. It was on Day 4 that we received our first introduction to one of the parks. 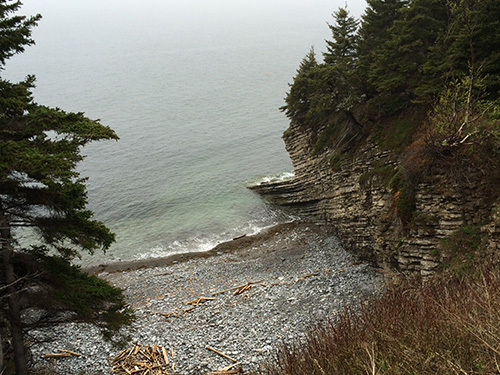 Forillon National Park sits on the outer tip of the Gaspé Peninsula, and though we are a long way from Quebec City and on the opposite side of the river, we are still in the Province of Quebec. Even more surprising, the mountains in Forillon, Canada’s first national park (1970), are actually the northeastern end of the Appalachian chain. 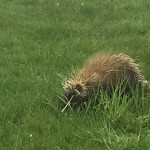 Porcupines are native to Canada’s Gaspe Peninsula. 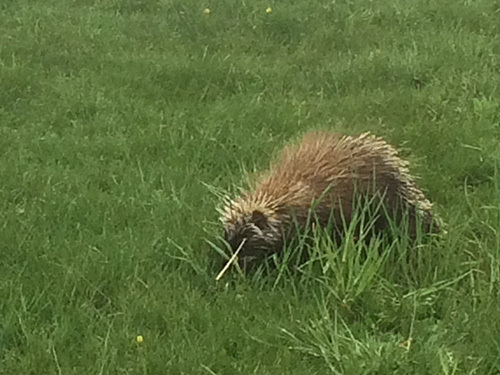 This one lunches away near the solar-powered lighthouse in the Forillon National Park, seemingly unbothered by the dozen hikers who are nearby snapping photos. To get there, we board a Zodiac (motorized rubber raft), which ferries us from the ship, Ocean Endeavor, to a dock near the town of Gaspe. This town of 15,000 had once hoped to become a major shipping center, but lost to Montreal and Halifax. And before the arrival of the Europeans, these heavily forested acres and waters of the Gulf of St. Lawrence were home to the Mi’kmaq and Iroquois peoples, who hunted and fished here in the summer months. 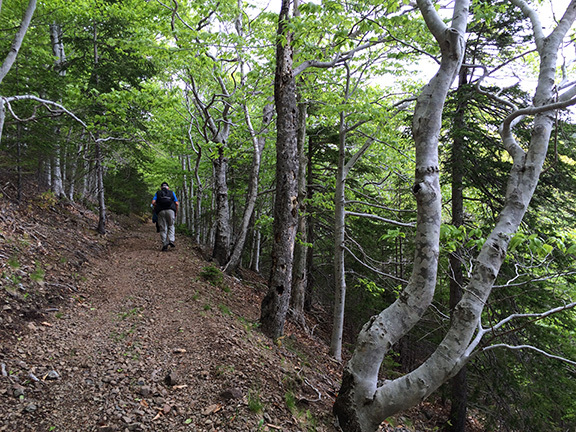 Hikers in Forillon National Park see this scenic coastline. Before the arrival of Europeans, the area was the hunting and fishing grounds of the Mi’kmaq and Iroquois. From the dock, it’s a short bus ride to the trailhead for our 2.5-hour hike along the rocky, fog-shrouded southern coastline of the peninsula. 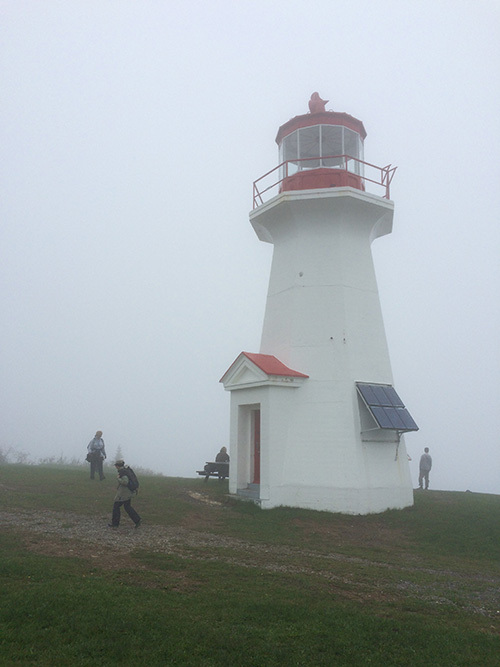 Our reward for conquering the gentle incline and reaching the peninsula’s end is a picturesque, solar-powered lighthouse and a gathering of several porcupines, lunching on the surrounding lawn. 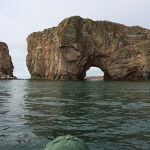 Our ship doesn’t have to sail far for our next stop — Ile Bonaventure (Bonaventure Island) and Rocher Perce (Perce Rock) Provincial Park, established in 1985. The 375-million-year-old rock was so named in 1607 by Samuel de Champlain because of the holes he saw “pierced” into the massive limestone formation. 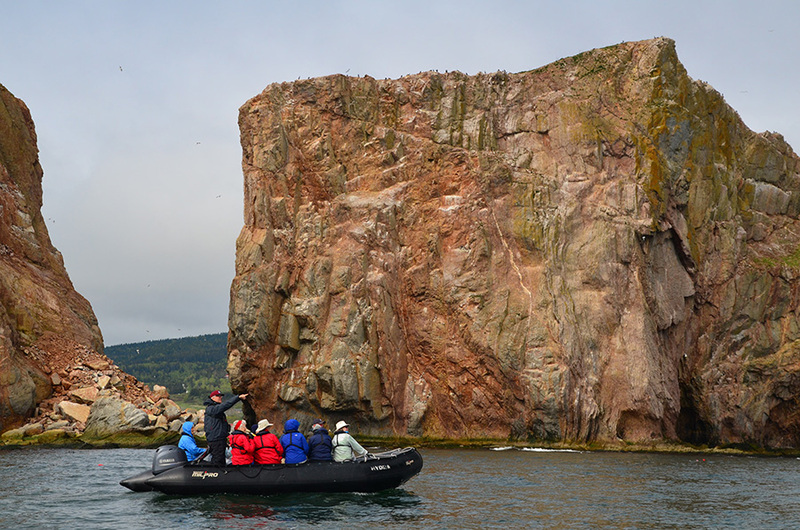 Most of the 169 passengers again pile into 20 Zodiacs, which take us with a few hundred feet of the formations. 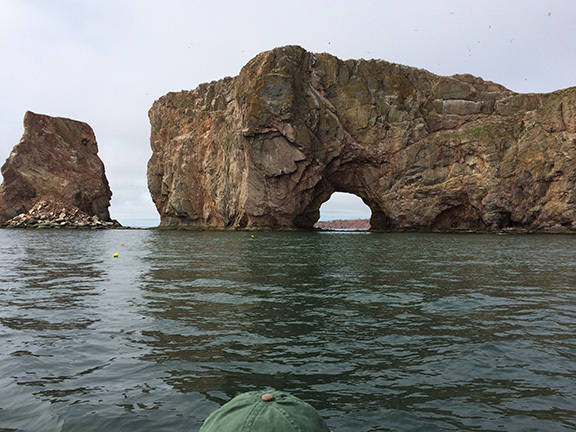 For the next couple of hours, we bob up and down in the Gulf of St. Lawrence, marveling at this geological wonder and gazing at the 110,000 northern gannets nesting on the limestone ledges, soaring above us and diving into the gulf. These amazing birds also share their territory with 200 other species of birds, including puffins, cormorants and gulls. I’m glad to have my binoculars and my meclizine. 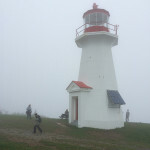 A solar-powered lighthouse awaits visitors at the end of a trail in Forillon National Park, at the very tip of the Gaspe Peninsula, part of the Province of Quebec. Two days later (Day 7), we arrive in Cheticamp (population 3,000-plus), on the far northeastern shore of Cape Breton, Nova Scotia. 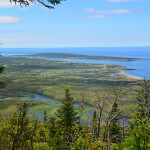 It’s a short ride to the western entrance of Cape Breton Highlands National Park. 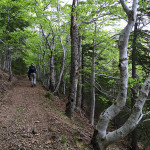 We meet with a ranger who accompanies us on the L’Acadien Trail, stopping occasionally to educate us on the park’s history, geology, flora and fauna. I’m more than happy for the breaks, as this is a trail that only goes up. 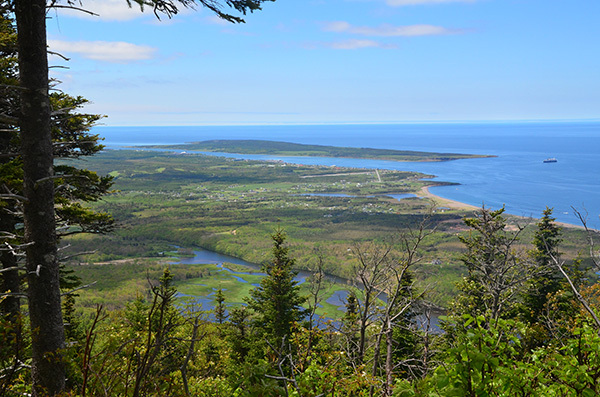 Hikers who endure the steady climb and the black flies on the L’Acadien Trail in Cape Breton Highlands National Park are rewarded with this view. The effort and energy expended, as well as the insects, are worth it, though. The end of the trail provides a spectacular view of the Cape Breton coastline, which could easily pass for a serene watercolor. It takes us a few minutes to realize that the tiny speck waaaaay out there on the ocean is the Ocean Endeavor. 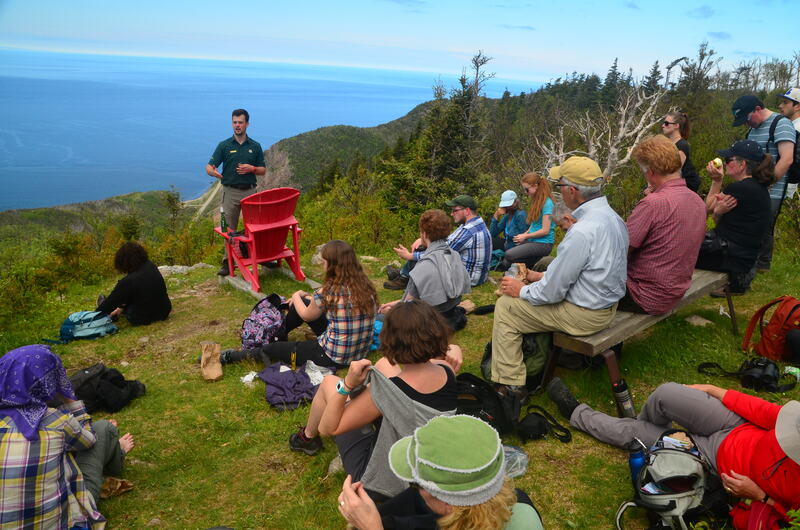 A steady uphill trail in Cape Breton Highlands National Park takes hikers to a viewpoint that affords a panoramic view of the Nova Scotia coastline. “The Mighty St. Lawrence” cruise, offered by Adventure Canada, has been named by National Geographic as one of its “50 Tours of a Lifetime.” Visit www.adventurecanada.com. For more photos, visit www.facebook.com/elouise.ondash.